The Big Bounce America comes to Dacula this weekend. 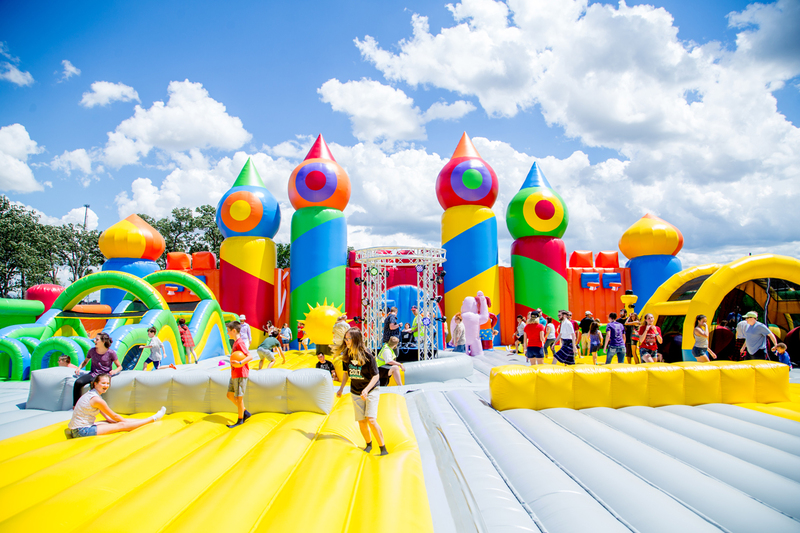 Details: Self-proclaimed as the “world’s biggest bounce house,” this 10,000-square-foot inflatable party zone features an obstacle course, jungle animals, a basketball court, a slide that drops you in a big ball pit, and even a dance floor. Just remember to bring socks and try not to sprain your ankle. When: May 3, 7-10:30 p.m. Details: This benefit for No Kid Hungry celebrates its 30th anniversary this year and will feature tastings from more than 75 restaurants, as well as live and silent auctions and wine tastings. Honorary chairs chef Alton Brown and Heavyweight Champion Evander Holyfield will also be in attendance. When: May 5, 11 a.m.-11 p.m. Details: Hector Santiago’s popular burrito pop-up makes a comeback for Cinco de Mayo. Along with chicken, barbacoa, and smoked tofu burritos, you can also grab pozole, shrimp and octopus ceviche, and tofu and roasted veggie nachos. Jazz in the Sky takes place on the helipad of Colony Square. When: May 8, 6-8 p.m. Details: Take your Atlanta Jazz Festival experience to another level—literally. Every Tuesday in May, AJF and Colony Square will host a limited number of guests for live performances on its helipad, which is perched on the rooftop of the 22-story building. Bring your own drinks and snacks, but seating is provided. In small print, the invitation notes that guests need to be able to climb five flights of stairs (no problem) and have no fear of heights (small problem). The helipad sits in the middle of the roof surrounded by a two-story wall; but because the platform rises well above that enclosure, the final sets of stairs really do feel like a stairway to heaven. Register for Colony Square’s emails for a chance to RSVP. Musician Jacob Deaton, an America’s Got Talent vet, will be the lead musician for each event and will play with a different trio combination each week. Additional reporting by Betsy Riley.